But I'm not going to list them all here. Besides, really it's just a list of years; on the other hand, those years add up to Jim. And I'm kind of partial to Jim. Yes, folks, it's make-a-cake day! And also eat-a-cake day! I'm sure you all saw pics of his cake on fb or instagram (or both) already. 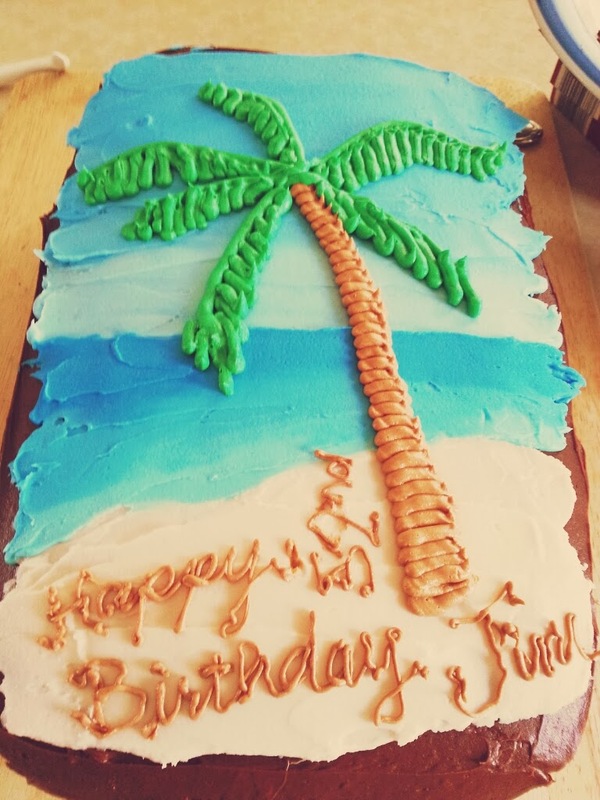 Jim never did give me any input on how to decorate the cake, so I had to come up with it on my own. I picked what I hoped was a highlight of this past year (despite the red eyes--come to think of it, I should have put a pair of red eyes on the cake somewhere). He has also been complaining about the winter. Personally, I don't know what there is to complain about; it's Minnesota, winter is SUPPOSED to be cold and snowy. But whatev. He seems to like "warm weather" or whatever it's called.